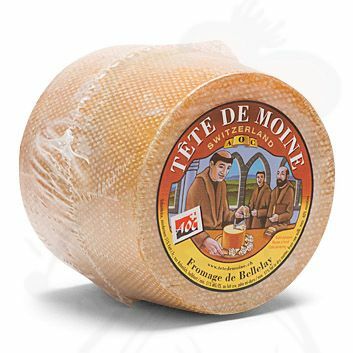 The Tête de Moine is semi-hard, dark yellow with a brown-yellow ribbed crust. The cheese is not cut but shaved, currently mostly with a cheese curler. The crust separates in pieces when shaved and the cheese forms rosaces. The “Monk's head” cheese from Switzerland is an exquisite delicacy originating from the Berner Jura. The cheese is made from whole summer cow's milk and was first produced in 1192 in the “l’Etoile”abbey. The Bellalay, another name for Tête-de-Moine, is a strongly pressed cheese with a full taste and a herby aroma.